Sandy Key’s beaches are forever protected by the neighboring National Seashore Preserve. If you prefer your walks on the beach, solely in the company of the sea gulls, Blue Herons and sea shells, then Sandy Key is the place for you. Sandy Key is located on 800 feet of Beach Front. This unit has 1219 SF of living area and a 200 SF beach front balcony. Ceramic throughout Living, Dining, Kitchen, Master Bedroom with Carpet in Guest Bedroom.. Electronics include 50” Wall-Mounted TV, DVD in Living Room, 32” Wall-Mounted TV, DVD in Master and Guest Bedroom. 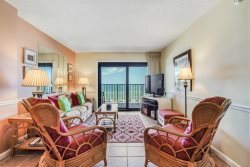 Sandy Key 415 was completely remodeled in 2016. Michelle was awesome in assiting me to find a unit that met our needs. The front desk members were courteous & helpful in every way. We had a gloriouos time. The unit was beautiful and well kept. We were very comfortable. We can't wait to go back. We have never had a bad experience with Perdido Realty and as always you exceeded our expectations. Thank you so much and we'll see you next time. We enjoyed our stay - thank you for all your help. We'll be back! Loved the condo, it was clean spacious and comfortable. Great Condo! Very nice and clean. Beautifully decorated! We will definitely be back.